Imaging patients of this size, whether studies are related to bariatric surgery or a multitude of other reasons, can present a variety of challenges for the radiologist. 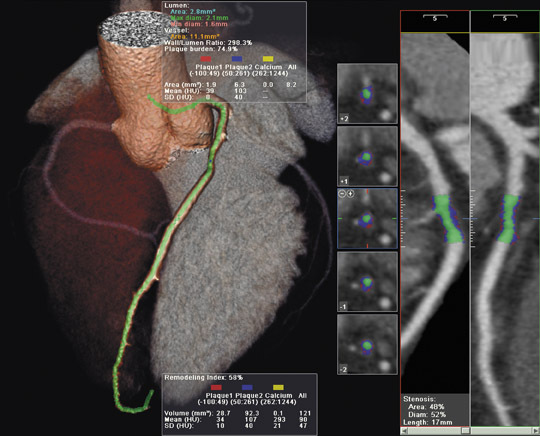 In order to address these issues, Siemens Medical Solutions (Malvern, PA) recently introduced the Somatom Sensation Open computed tomography (CT) system with 40-slice technology (Figure 1). This system was designed to accommodate patients weighing up to 615 lbs. The first commercial installation of this system was completed at the Mayo Clinic in Rochester, MN, where it will be used for cancer and routine diagnostic imaging as well as for image-guided interventional procedures. The system features an 82-cm large gantry bore, an 82-cm extended field-of-view (FOV), and a high-capacity patient table designed for patients weighing up to 615 lbs. Most conventional patient tables have a 440-lb limit. "The SOMATOM Sensation Open is ideally suited for all of our very heavy patients and our bariatric surgery program," said Cynthia McCollough, PhD, Associate Professor of Radiological Physics at the Mayo Clinic College of Medicine. "The system is a high-performance CT scanner that provides a large gantry opening and large reconstruction FOV with a high-capacity patient table. In addition, the Straton tube provides the X-ray output needed for high-quality images in very large patients." The scanner features the company's proprietary 20-slice Ultra Fast Ceramic detector with 1.2-mm collimation and a 0.5-second gantry rotation speed that enables 3-dimensional volume coverage of 72 mm/sec. A dedicated extended FOV algorithm extrapolates the area outside the standard 50-cm scan field, for a complete image of the entire anatomy. The system also features Siemens' z-Sharp Technology and its Speed4D Technology. With the z-Sharp Technology, an electron beam is rapidly de-flected, creating 2 alternating and over- lapping X-ray projections reaching each detector element, thereby doubling the scan data without increasing the radiation dose. The Speed4D Technology is a compilation of 4 technologies that, the company notes, were designed to enhance imaging performance and improve workflow. The first of these is the Straton X-ray tube, which is designed to eliminated cooling delays and maximize patient throughput. Siemens reports that the Care Dose4D component provides fully automated dose management with up to a 66% dose reduction. The WorkStream4D provides automated image reconstruction with speeds up to 20 images per second, and the syngo InSpace4D component allows for real-time interactive cardiac evaluation in space and time. 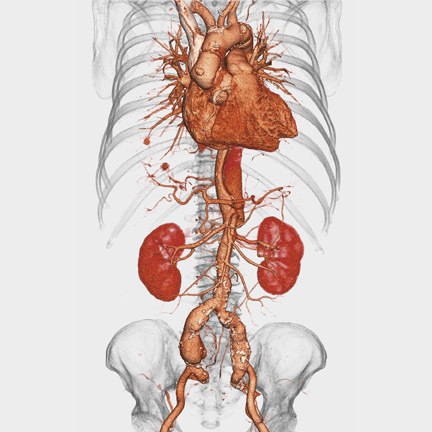 For interventional procedures, such as drainages, biopsies, or pain therapy, the system's optional Care Vision CT software automatically reduces the radiation dose to the physician and the patient. This package includes the company's HandCARE program that automatically turns off the X-ray beam at user-determined scan projections to reduce direct radiation exposure to the surgeon's or radiologist's hand. The software provides the simultaneous display of 3 contiguous slices directly at the patient table, allowing the physician to view the travel path of a needle or probe in real time. Philips Medical Systems (Andover, MA) introduced a new cardiac ultrasound scanner at the European Society of Cardiology Congress 2005, which was held September 3 to 7 in Stockholm, Sweden. According to the company, the HD11 XE, which features a flat-panel display, was designed to provide more accurate measurement of the heart chambers, wall motion, and ejection fraction, and includes the company's QLAB quan-tification software to enhance noninvasive assessment of cardiac anatomy and function (Figure 2). The system can perform strain quantification using Tissue Doppler Imaging, allowing the user to quantify velocity and evaluate patients for synchronization therapy. It also provides automated intima media thickness measurements of the carotid and other superficial arteries, and region-of-interest (ROI) quantification to analyze pixel intensities from 2-dimensional (2D) or color Doppler data sets in up to 10 user-defined regions. The system can then graph these ROIs over time. The HD11 XE platform features broadband digital transducers and beam-formers designed to capture and preserve the entire bandwidth of ultrasound. Using the system's SonoCT mode, with up to 9216 digital channels per image frame and advanced beam steering, the HD11 XE can reportedly acquire up to 9 times more broadband tissue information than other systems. The proprietary Fusion Signal software-based image-forming feature supports faster control panel selections, expanded automation capabilities (including the company's iSCAN technology), and complex image processing algorithms requiring millions of calculations per second, resulting in what the company says is true High Definition imaging. TThe proprietary Fusion Signal Processing feature uses parallel signal processing to divide returning broadband signals into subbands and to analyze each individual component. The software-based image-forming featuresupports faster control panel selections,expanded automation capabilities (including the company's iSCAN technolgy), and complex image processingalgorithms requiring millions of calculations per second, resulting in what the company says is true High Definition imaging. The iSCAN intelligent optimization technology automatically samples digital data and adjusts gain, time gain compensation, and compression on 2D images with the push of one button. It also provides automatic scale and baseline adjustments when operated in Doppler modes. The XRES (Extreme Resolution) technology feature provides real-time analysis and refinement of image patterns at the pixel level, processing 350 million calculations per frame, in real time. According to the company, this process "virtually eliminates speckle noise artifact and dynamically enhances tissue textures, margins and borders." Technology and Industry: Multislice CT for imaging morbidly obese patients; plus, a new cardiac ultrasound system. Appl Radiol.